Good news for CLOUDES’ modelers that need time management or just compete against the clock! Hamdi Kavak developed a Chrome Extension that integrates the popular Toggl button with CLOUDES. Toggl (https://toggl.com/) is the leading software as a service time management/tracking tool. Modelers need to open a Toggl account. After installing the extension, the Toggl button (Start timer link) can be found at the top left of the design area, below the name of the simulation, as shown below. The button would allow you to know how much time you spend working on a simulation. If you wander onto other simulations, the timer will keep running. You need to stop the timer when you finish your work. You can then go to your Toggl account and see how much time you spent on your simulation as shown below. There you can explore the functionalities provided by Toggl when it comes to time management. Reminder to Internet Explorer users: while CLOUDES runs using explorer, its performance may not be optimal. We recommend using either Chrome or Firefox. In addition to English, Turkish and Spanish, we added German and Portuguese language options for the Design and Load pages. Language options are now accessible directly from the Load page. Thanks to Umut Durak, from the German Aerospace Center (DLR), Institute of Flight Systems and Roberto Carlos Cabrales, from the University of Bio Bio (Chile), Departamento de Ciencias Basicas, for their translations of the system. This paper provides a discussion on the educational benefits of cloud-based simulation learning environments (CSLE), requirements for building them and some of the challenges. CLOUDES relies on a protocol called WebSocket to provide a better simulation running experience. Our implementation of the protocol requires port 8887 to be allowed. If this port is not allowed, you may not be able to run your simulations behind your organization’s firewall. To address this, you need to contact your organization’s network administrator to allow port 8887. CLOUDES is an ongoing STEM research effort, led by researchers at the Virginia Modeling, Analysis and Simulation Center at Old Dominion University, focused on making simulations accessible to anyone. As such, we expect students, from middle to graduate schools, to benefit the most as they will have access to an intuitive simulation environment that focuses on the modeling process (moving from observation, to conceptual model, to simulation model and ending with analysis of results). These capabilities are available through a browser across computing platforms with no need for writing code. To maximize student outreach, we encourage educators to use CLOUDES in the classroom. We have found the ability to document models, share them and reuse them very useful in our teaching activities. In our testing/teaching sessions, students of all ages have found the environment easy to use when focusing on learning how to model not on learning the tool. The CLOUDES Manual, and the available short videos, is a good starting point as it focuses on the modeling process aided by the environment. Should you have questions or comments please send us a note to cloudes@odu.edu. Revamped user interface: we are constantly looking for ways to make CLOUDES easier to use. A simple and intuitive interface is part of these efforts. We reduced the number of buttons (and added a new design) so you can access what you need faster. Settings and Replications can now be found under the Simulation Builder tab. Conceptual Design Module: This is perhaps the largest update. We have been testing this module for the last months and we feel confident you will find it useful. 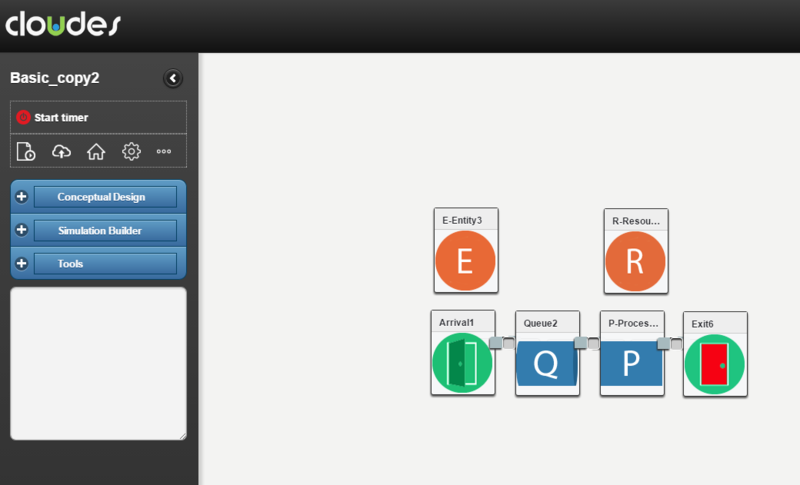 The module allows you to create a conceptual model and then convert it to a simulation model with a push of a button. The model is created with only one node that can later take the form of any node in the simulation model. Further details on how to use it will be provided in the blog (soon). Turkish is Available in the Design Area: You can access this option under your Profile. CLOUDES Design Area is now available in English, Spanish and Turkish. More language options will become available soon. We hope this change makes simulation use and creation accessible to more users worldwide. Documentation Upload: Under Settings, you can now upload a pdf document of your work. This allows you to keep track of your work and to facilitate others the replication of your public models. Description Nodes: To further facilitate your documentation, you can add as many Detailed Description nodes as needed on both the Conceptual Design and Simulation Builder modules. Automatic Counter and Schedules Import: When you import a model, any counter and schedule associated with it will be saved in your account. Scheduling allows you to alter your resources (capacity) and inter-arrival time in Arrivals (the parameter for Poisson and Exponential distributions at the moment) for specific time intervals. As such, you would be able to model realistic time-dependent situations like rush hour, when arrival of customers increase during lunch time, or “slow times” like a reduction of cars in a toll booth during the hours of 9 pm and 5 am. This feature would allow the modeler to study the dynamics of the system during low and high traffic and establish how to allocate resources. 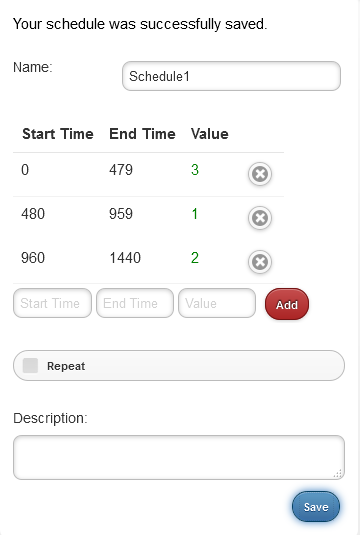 A schedule depends on the time unit and simulation length of the simulation (see the environment tab). If the time unit is in minutes, then the schedule is in minutes. Likewise for days, hours and seconds. Considering simulation length, the modeler needs to assess what would be the period or periods where capacity and mean will change within the full timeframe. For instance, Schedule 2 in the figure below shows that within a day (1440 minutes) there will be three values for capacity: the one already assigned will go for the first 8 hours (479 minutes), a capacity of 1 will go for the following 8 hours and a capacity of 2 will go for the last 8 hours of the day. The repeat option works by taking the full span of your schedule and repeats based on that. For instance, if we run the simulation for two days (2880 minutes) and don’t want to enter values for the following day in the schedule, the repeat option would use the same values after adding the time interval: it will assign 1 at 1920 and 2 at 2400 until it finishes. Note the default capacity specified in the resource node is used from 0 to 479 minutes, and on repeat, the default will again be applied from 1441 to 1920 minutes. 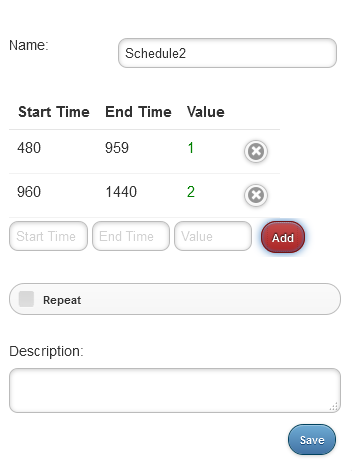 If you wish to use a value other than the default value during those times, a schedule like the one below would need to be used. In this case (schedule1), if the repeat option is used the capacity of 3 will be assigned from 1441 until 1920; capacity of 1 from 1921 until 2400 and capacity of 2 from 2401 until 2880. The same schedule can be applied to generate inter-arrival time in the Arrival block. As previously mentioned, it works for Poisson and Exponential distributions so far. It is noted that when applying a schedule to an inter-arrival distribution, a value of 0 in the schedule will stop the arrivals. The arrivals will remain stopped until a simulation time is reached in which the scheduled value is greater than zero. Lastly, the resource block restricts capacity values to integers. However, the schedule permits decimal values. If a schedule which contains decimal values is applied to a resource, those decimal values will automatically be rounded to the nearest integer value during the build of the simulation. If the same schedule is also applied to an inter-arrival distribution, those decimal values will remain unchanged.